Working out. Exercising. Staying in shape. Some forms of exercise can leave you feeling beat up, like high intensity interval classes or bootcamp style workouts. Others like lifting weights or running can leave you overly sore or injured! No wonder so many people just stop trying. The reason so many people Love, not like, LOVE Pilates, is because of how it makes them feel. Instead of feeling overworked, achy, tired or sore at the end of a workout, they feel stretched, refreshed, awake, alive and happier! There are so many reasons why this is usually the case and people can become addicted to Pilates. 1 –> We make sure to move the spine in every direction in every class. Your spine is the centre of your health, when you lose freedom of movement along your spine everything tightens up. When you begin to introduce that natural movement it massages every cell in and around your spine which feels so good! 2 –> Following along in class forces you to be present. Our lives are so overwhelmed day to day with schedules, work and the endless ways we are reached through advertising and devices. This effects us more we realise since it is almost ever present. A full hour of movement and focused awareness on your self is so beneficial for your brain and your soul! Our classes incorporate breathe awareness, utilisation and focus which has been proven to have deep physiological benefits. As one of the core principles of the Pilates Method, Joseph Pilates knew its importance for overall wellbeing. Some people perpetually breath in a shallow way, which is quite stressful, just by breathing deeply and rhythmically many people feel like they’ve had a weekend away! In the same way that following along forces you to be present, much of the instruction, or “Cueing” is asking you to bring awareness to different areas of your body and move them in particular ways. This deepens your connection to yourself which has a grounding effect. It just feels good to be connected with your own body! 5 –> Joint preparation and health. The Pilates Method loads your joints (hips, knees, ankles, shoulders, elbows) in a safe and intelligent way that reverses years of inactivity. 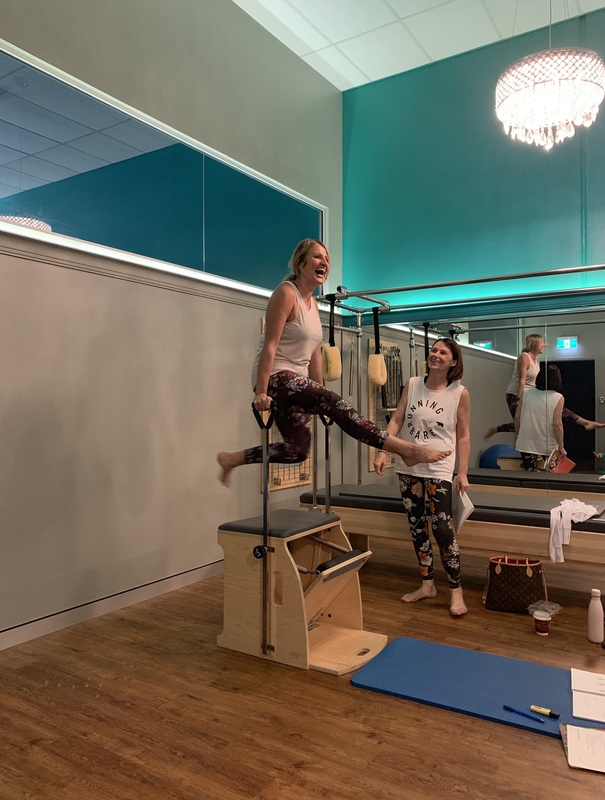 I call our Feel Good Reformer class “Tin Man’s Oil” because the movements and exercises we use are freeing up stiffness and strengthening weakness in your joints! 6 –> Competition is natural but left at the door. We foster and encourage a vibe that does not include competition. Our worlds are filled with comparison and competition. We believe it’s not healthy in a Pilates studio. When a client is told, “Don’t worry about anyone else but yourself, there is no rush, don’t force or push beyond your current limit” there is a freedom in that. Progression happens naturally. Those who are used to pushing endlessly almost take a sigh of relief at being able to just let it happen organically! 7 –> It’s not about how you look. We believe that health and fitness is not about how you look but how capable your body is and how you feel. By eliminating this from our community many people just feel more included, accepted and never judged. It also gives our clients a break from the constant bombardment that the multi billion dollar fitness industry is perpetuating! Clients are always amazed and excited at what they can do as they progress, it’s so uplifting for us to watch people progress and push their own preconceived beliefs of what is possible for themselves. 8 –> We involve the Core as much as possible. The core is not the 6 pack we see on the cover of every fitness magazine. It is a corset of many muscles through our torso that supports the spine, protects and produces many of our movements.. when it is strong and working that is. Working the core muscles out is apart of every class we teach. When you learn to utilise this powerhouse of muscle to initiate almost all movement you physically feel powerful! 9 –> We Smile. Joke. Laugh. Working out should be ENJOYABLE, it should be a celebration of your absolutely amazing body! We do our best to have fun in class, to be uplifting and playful with each other. Who doesn’t want to spend some time in a positive environment?! 10 –> We love Pilates and our clients. To spend time in a place where you feel accepted, cared for, not pressured to perform, not judged but encouraged, is special. We try our best to create that in our Pilates Klinik for our clients because we love Pilates, we love sharing it with others and we love helping people feel empowered. Is it nice to drop a jean size and fit back into your favourite cute pair? Of course (way to go Gillian hehe), is it nice to be able to sit cross legged again after many years? Of course (well done Margs hehe), is it great to find a form of exercise that gives you a break from all the pressures of life and leaves you feeling better than when you walked in each time that is enjoyable as well? Absolutely.